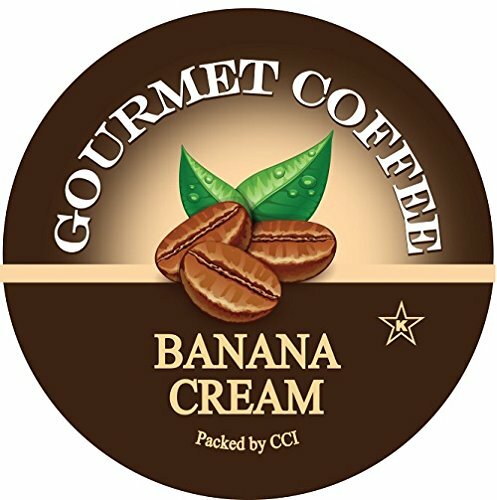 If you love the taste of fresh bananas blended with cream, our Banana Cream coffee is for you! Full of flavor, fresh roasted gourmet coffee. Smart Sips single serve coffee cups for Keurig K-cup machines are made from the finest coffee beans, bringing quality and unforgettable taste to the palm of your hand. Try our other gourmet coffee, hot chocolate and cappuccino flavors including: GOURMET COFFEES Raspberry Rum Ball Bananas Foster Chocolate Peanut Butter Chocolate Amaretto Banana Cream Chocolate Cherry Cordial White Chocolate Hazelnut Truffle Blueberry Cinnamon Crumble Pumpkin Spice Cinnamon Roll Chocolate Orange Chocolate Raspberry Cognac Sambuca Irish Cream Rum Jamaican Mudslide Dark Chocolate Coconut Almond Cookie Totally Nuts Dark Chocolate Cranberry Decaf Chocolate Raspberry Decaf Blueberry Cinnamon Crumble Decaf Pumpkin Spice Cinnamon Roll. HOT CHOCOLATES: Red Velvet Hot Chocolate Bananas Foster Hot Chocolate Chocolate Peanut Butter Hot Chocolate Chocolate Raspberry Hot Chocolate Caramel Cream Hot Chocolate French Vanilla Hot Chocolate. CAPPUCCINOS: Almond Cookie Cappuccino Red Velvet Cappuccino Irish Cream Cappuccino French Vanilla Cappuccino Cinnamon Cappuccino Hazelnut Cappuccino S'mores Cappuccino. Smart Sips Coffee, Hot Chocolate and Cappuccino are compatible with all Keurig K cup brewers including the Keurig 2.0. We are excited to launch our new packaging! Some boxes may still be in previous packaging. View More In Single-Serve Capsules & Pods. If you have any questions about this product by Smart Sips Coffee, contact us by completing and submitting the form below. If you are looking for a specif part number, please include it with your message. By THE ORGANIC COFFEE CO.